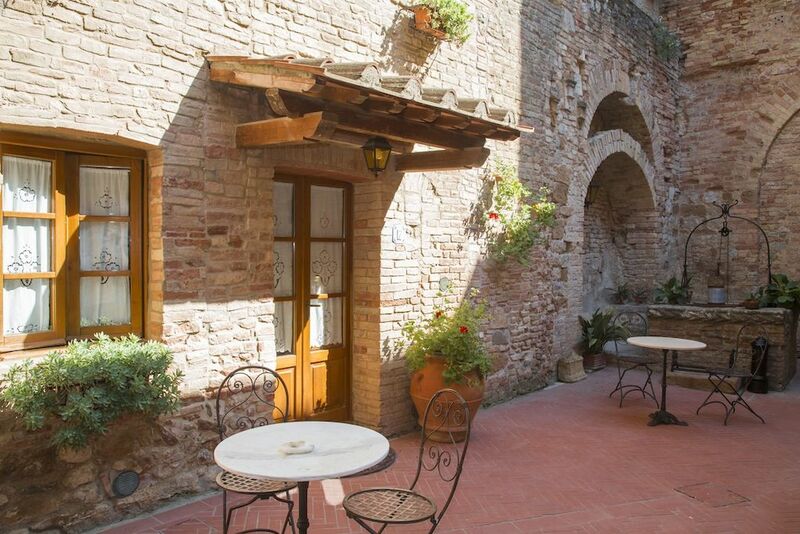 apartment in historical center san gimignano, chianti, tuscany. Apartment with double bed, with private entrance, bathroom and kitchen. Orthopedic mattress. Vaulted ceilings and beams, terracotta floors. Courtyard with tables and chairs for relaxing. You can get the front door for loading and unloading luggages, free parking near the door of St. Matteo. Bus stop 50 m, at the door san matteo. Within walking distance of shops, bakery, bars, restaurants, chemist, newsagent, tobacconist, grocery, library, wine cellar and hairdresser. we are in the full center of San Gimignano, in Via San Matteo, the main street, along the ancient Via Francigena. A few steps from Porta San Matteo, the bus to Florence or Siena or train station Poggibonsi. we are a short walk from the main square of the city and countless architectural works, including the beautiful Romanesque cathedral. San Gimignano is situated in a strategic position to explore the surroundings and the main cities of art in Tuscany, such as Siena (34 km). Florence (49 km), Volterra (30 km), Pisa (90 km), Colle Val D'Elsa (10 km), Monteriggioni (20 km) and Montalcino (90 km), easily visited on a day trip. Chianti Classico (30 km) with the ancient villages of Castellina in Chianti, Radda in Chianti, Gaiole in Chianti Greve in Chianti and the Crete Senesi (40 km) with Pienza, Montalcino, Montepulciano .. Unique accommodations with great hosts. Charming apartment in a walled fortress city. After a bit of searching for parking we really enjoyed our stay. Luigi and Marzia are great hosts. The property has been in the family for generations. It was nice to hear the history of the estate and explore this charming city. Clean well kept with free wifi. So many good restaurants within a short walk and a bakery nearby. Wish we had more time to spend there. Hello Mitchell, thanks you so much for your words, we are really in the main street. very helpfull for our guests. All the best for you. for travellers: we send always at our guest email with itineary for enter inside the area traffic limited and arrive in front our door. When you arrive here we will give you informations for free parking with a map for find immediatly place. Very unique and fun! A beautiful place. I'm so glad that we stayed here. The host is very sweet and the apartment and patio were beautiful. It felt very authentic- not like a plain hotel at all. The only thing that we missed was A/C but even in July it wasn't a big deal. I highly recommend this spot. Thank you so much for your positive feedback and kind words. We are pleased to know that your experience at our apartment has been nice and memorable and that the suggestions and information provided have been helpful for you to enjoy San Gimignano at its fullest. We hope to meet you again in the future, all the best you all! We only stayed for a week but we packed a lot in due to the help and information provided by Marzia. Let her know what your interests are food, music, wine tours etc and Marzia was there with suggestions. So thanks Marzia. The Piazza was a great historic place to stay and the location was ideal for bars, restaurants, shops & public transport with out worrying about noise etc. We traveled by pubic transport from Pisa airport and Marzia helped with our early return to Poggibonsi train station by arranging a car pick up. Thank you for the lovely words! Yes, you can ask Marzia or the Staff any suggestions for your dinners, walks, tours and much more, we always provide all the information we have available, also because we think that it's very helpful and can come in handy to the guest. Hopefully we will be able to meet you again, it was a pleasure for us to host you! Take care and all the best to you all. This place is centrally located on one of the main streets of this beautiful walled city. You can walk the entire town comfortably. The owner Pierluigi and his wife do everything they can to make your stay memorable and comfortable. We were in room 7 which is on the first floor and is fully equipped with everything needed to cook your own meals which is cost containing. There is a supermarket at the entrance to the town which you can walk to or ride the local mini buses for .75 €. Tickets on sale in Tobacco shop next door to apartment. We were there for a week and were able to also rent a car for about 90€ including gas, which is very expensive in Italy. With the car we drove to the Chianti region and were able to visit many small towns and had lunch at a small restaurant where we got the best meal we had in Italy. Gelato shops in the main square have the best gelato. Although weather was a bit chilly we thoroughly enjoyed our stay and want to thank Pierluigi for his hospitality. The trip to SanGi was by train from Florence to Poggibonsi where right outside the train station you catch a bus for a 20 minute ride to town. Bus tickets are purchase inside train station at Tobacco shop. You get off at San Mateo door which is literally steps from Pierluigi's beautiful building. Would definitely recommend this lodging and hope to return! my 3 friends and i were on vacation from Los Angeles,CA for 2 weeks traveling around italy and we stayed in this town for 3 days and was one of the best times we had in italy. very quiet and cozy at night when all the tousist go back to where they were staying. i would highly recommend staying here. The palace is situated in the midst of Tuscany, in San Gimignano, a beautifully preserved medieval hill town, Placed strategically between Pisa, Florence, Siena, Lucca and Chianti, and It provides an ideal base for the exploration of Tuscany. Palazzo Buonaccorsi, is a wonderful Historical House, dating from the thirteenth century and is located in the main street of the historic center of San Gimignano, inside the city walls. Step away from the most beautiful squares of the medieval town and its imposing towers. The apartments and rooms are comfortable, furnished with antiques and tastefully selected. The apartments have the entry into the courtyard of the palace, very quiet area. This feeling of intimacy and ease, is further Top ENCOURAGED by the Italian Pierluigi of welcome, together with His wife Marzia, and the Their valuable informations. Their are proud to continue this family tradition, opening the doors of this ancient historical residence and to offer Their guests a very pleasant stay under the medieval towers of San Gimignano. Residenza d'Epoca Palazzo Buonaccorsi is a haven of solicitude and courtesy from the family Boldrini.